Artist Elizabeth Tyler: Drama in New York! On the second day of my New York visit I wasn't feeling well but tried to ignore it and met up with May for another tour of galleries in the city. After that it was a great privilege to be invited to the Manhattan home of May and her husband Bob. I was able to study May's impressive works of art while Bob entertained on the grand piano. I really and thoroughly enjoyed the beautiful music, amazing artworks and an awesome view of the sunset over the Hudson river. Unfortunately though my stay in New York didn't turn out to be so perfect as it started off. In the evening, back in my room at Queens, my stomach pains got unbearable. I was alone in the apartment so I rang May to ask for advice, she told me to ring 911. 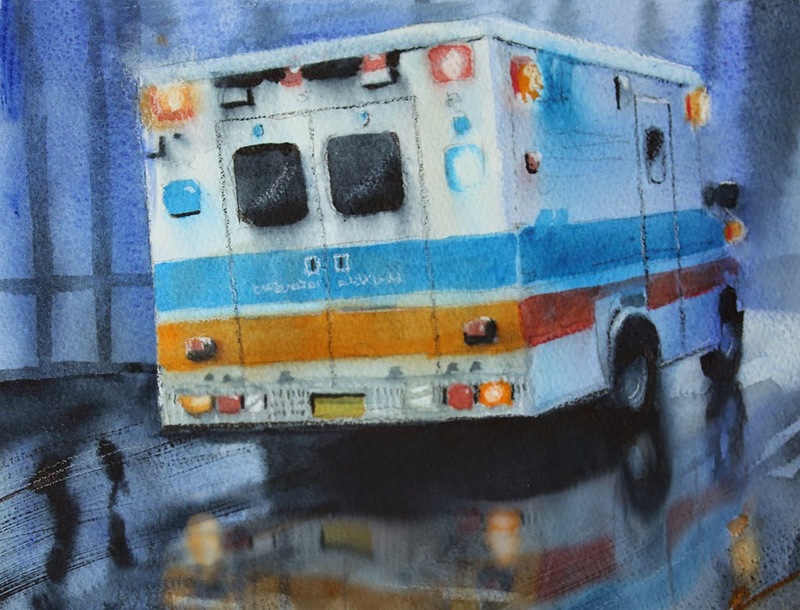 It was definitely not on my bucket list to be dashed across New York in an ambulance with flashing lights and and howling sirens, but that's what happened next! I was taken to New York Presbyterian hospital in Manhattan and after 24 hours in the emergency department the diagnosis was: acute diverticulitis. After that It turned out that I couldn't tolerate the antibiotics they prescribed so I had to stay for another 5 days. That was my week in New York! So for the 2nd time on this trip I missed my flight, this time it was my trip home that wasn't possible. On the very last day of my extended stay in New York I was grateful to be collected by car and taken to Staten island for dinner and sightseeing. Thanks to the great initiative and effort of Lynn and Tom and the kind hospitality of Josefine. I did finally get to see a glimpse of the statue of liberty (far left) from Staten island. Fortunately I had a travel insurance. They payed the hospital bill, arranged and payed a hotel room after my discharge from the hospital and a new flight home. All in all a bill of 33,000 USD!!! I will never ever travel anywhere without insurance!